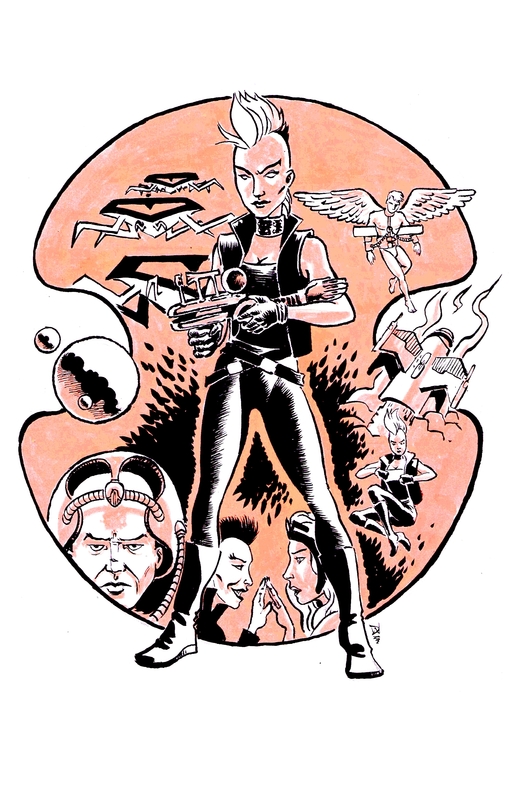 You’ve probably already seen it in the Episode 24 posts, but we are so in love with David’s Ororo: Queen of the Galaxy illustration that we’re posting it one more time for good measure. If you’re a collector of discerning taste, you can still snap up the original from David here; prints will be available here through October 5. Finally, on a slightly less cheerful note, it looks like episode 24 will be our last on Comics Alliance. This is a wholly amicable split–they’re shifting some things around in terms of how they handle podcasts, and it didn’t make sense for them to keep us onboard. Rachel’s still writing for them periodically, and updates will continue here–as well as on iTunes and Stitcher–as usual. Next week: Wolverine demonstrates the Inverse Ninja Law. In which Professor X is (canonically!) a jerk, Miles has Sidrian Hunter feelings, Kitty Pryde is Clarissa Darling with a dragon, we introduce a drinking game, the X-Men do Barbarella, Rachel has a ‘shipper moment, Rogue joins the team, Storm gets a haircut, Mastermind is still the worst, and Madelyne Pryor is underrated. Next Week: Claremont and Miller’s Wolverine! 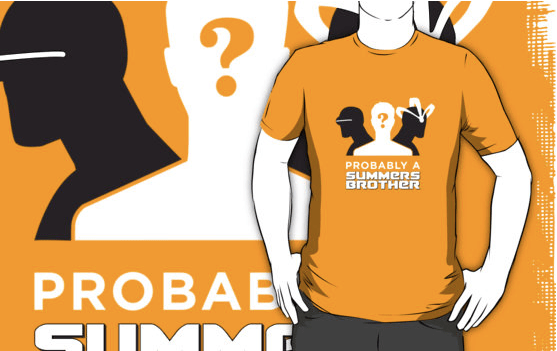 Since May, “Probably a Summers Brother” has been by far and away our most-requested shirt. Now, finally, with the help of designer Dylan Todd, IT LIVES. EDITED TO ADD: There’s now also a version of this design available on light colored t-shirts, stickers, totes, &c! YAYBO! In which the week belongs to the colorists. In which we play catch-up and review a record nine issues! 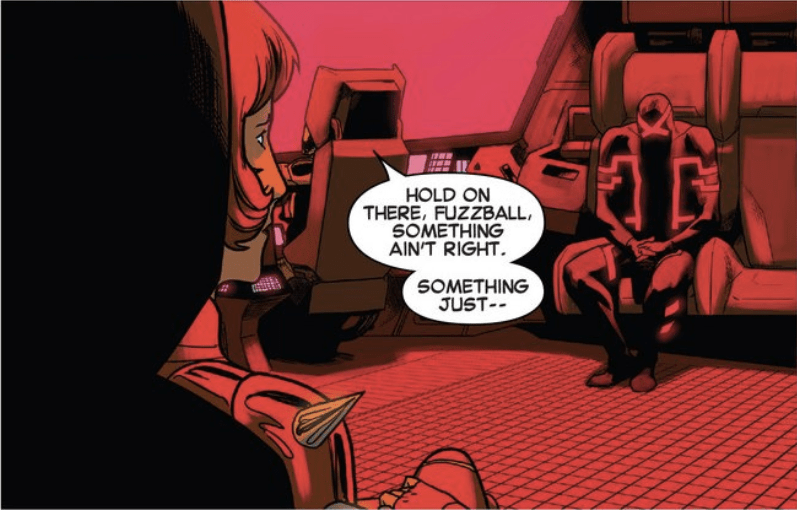 Rachel wrote more about Uncanny X-Men #26 over here. 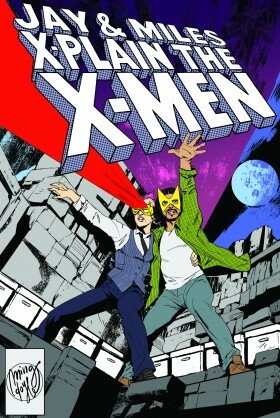 Cover art by Chris Bachalo from Uncanny X-Men #26. 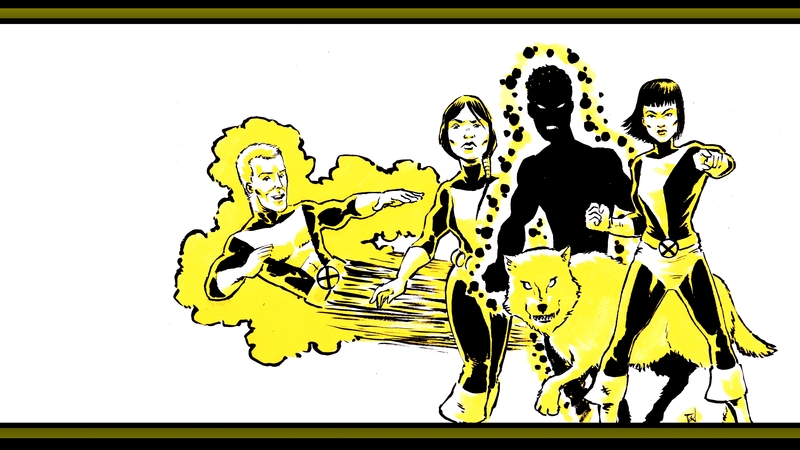 A couple weeks ago, I spent some time breaking down my favorite panel from Uncanny X-Men #25, and why it’s both a great Cyclops character beat* and a great illustration (ha!) of how visual storytelling can and should work. Right now, Uncanny is a semimonthly series, which means it’s alternating between two artists, Chris Bachalo and Kris Anka. That kind of switching off can be risky business: making it work takes a very carefully matched pair of artists, and which commonalities matter most in a given series isn’t always obvious going in. Bachalo and Anka overlap a lot superficially: they’re both stylish and angular, with clean line art and similar enough visual language to keep the transitions from being too jarring. More significantly, though–and critical to this series in particular–they’re both exceptionally good at conveying emotion through body language. 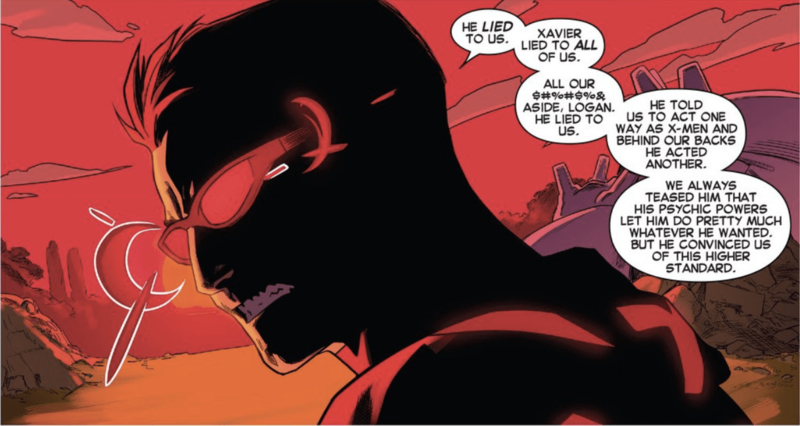 That’s particularly important here because Uncanny X-Men is currently in large part a book about Cyclops’s personal reckoning with the death of Charles Xavier–the mentor and surrogate father Cyclops killed while possessed by the Phoenix Force. 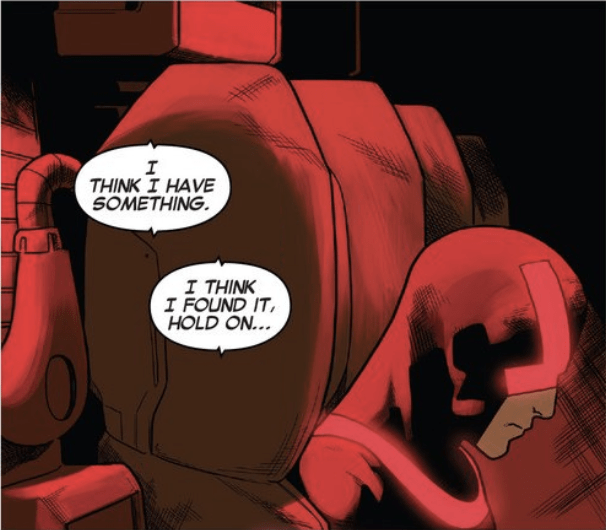 That means it’s a story driven largely by emotional beats–something to which Cyclops is singularly poorly suited on fronts both visual and canonical. Cyclops is kind of a block of wood. He’s uptight and very guarded–dude’s mantra is “I’m fine,” growled through gritted teeth. There’s nothing fluid about his body language–he’s all stiffness and angles, even in combat but especially in conversation. If you want to make Cyclops emotionally expressive and stay true to the character, you don’t get to use expository dialogue, and you definitely don’t get to use exaggerated expressions. You’re pretty much limited to subtle details. Now, as it happens, superhero comics have a standard visual shorthand for exactly that scenario. The catch? It usually involves subtle variation in the way you draw their–you guessed it–eyes. Not really an option here. That’s where Anka and Bachalo–particularly Anka–come in. Kris Anka isn’t someone I go to when I’m thinking of artists who are masters of facial expressions. He doesn’t have the expressive fluidity of, say, Sara Pichelli or Russell Dauterman, nor the explosive intensity of Bill Sienkiewicz. Anka is all about lines and angles, stylized and sometimes even a little rigid. With Pichelli, you look to eyes and hands; with Dauterman, mouths. With Anka, the emotional beats are all about exaggerated or broken angles: clenched jawlines, sagging shoulders, stances knocked slightly off-kilter. Kris Anka can do a lot with body language. Page one, and the only time I’m going to show you a panel with Cyclops talking. Note that even here, you can’t see a lot of his face. He doesn’t have his mask on, but he’s still mostly silhouette, aside from the clenched teeth. In fact, Cyclops only talks on one page of <em>Uncanny X-Men</em> #26. After the panel above, he says one more word. And then, over the rest of the issue, he just crumbles. 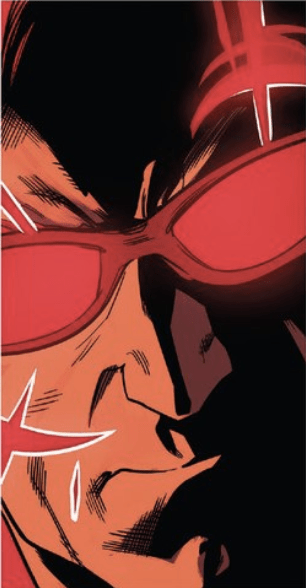 This is the first and only close-up we’re going to get of Cyclops’s face in Uncanny X-Men #26. Again, even when it’s not covered by the mask, his face is pretty much in shadow–in this case, shadow that includes a pretty direct reference *to* the mask. Anka’s also keyed in on something really critical here: Cyclops’s face doesn’t tighten when he falls apart. It relaxes. This is the last time in the issue that you’ll see Cyclops in the foreground of a panel with other characters: slightly off-kilter. Reaction shots from the back are hard; this is a good one. Notice the stiffness that’s still there, because that’s about to change. This panel originally contained narration about Cyclops, which I cut, because you don’t need it. I mean, you do in context of the issue, because it’s relevant to how the other characters currently see him; but what we’re talking about is how the reader does. Face is totally obscured at this point. This is almost a classic brooding-villain pose, but it’s not quite, because of two things: the angle of his head, and his hands. His face isn’t obscured by artful shadow; it’s obscured because his head’s hanging so far down. And his hands aren’t clenched or open–they’re loosely interlocked, like he’s not sure what to do with them. Cyclops is a character built–conceptually and personally–around tight control. There are two ways you can break that frame. One is explosive; you saw it in the early issues of this series, when his powers were broken and became wild, splaying hoops of energy instead of the normal neatly contained lines. The other is much quieter and more personal, and that’s what you’re watching happen here. Remember what I said earlier about clenched jawlines? What’s the other end of the spectrum? Softening Cyclops’s face is almost jarring. 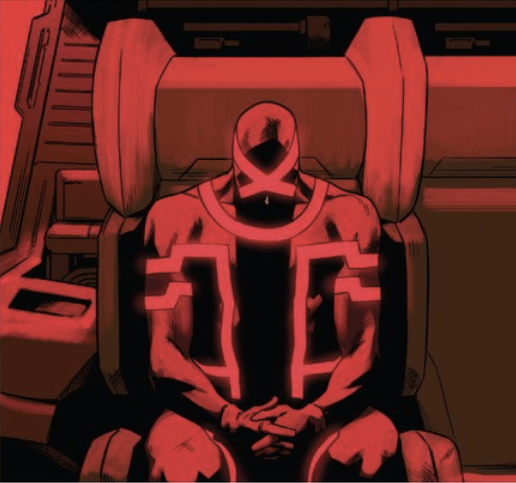 He looks like a kid–actually, if I had to choose a single word for the way he’s drawn here and in surrounding panels, I’d probably go with “childlike.” This isn’t how adult Cyclops sits or an expression we see on his face–both belong more to his 16-year-old counterpart. Meanwhile, the action continues around and in front of him–and again, since this is usually the guy barking out orders, having him literally recede into the background while other characters continue to work and talk past him is incredibly effective. Last one. Again, there’s that background trick. The sharp lines of his costume, the glowing X, underline the slump. Instead of tense and squared, his shoulders are hunched (and again, this is such kid body language, subtly amplified by those high Blackbird seats). This is someone who’s totally beaten, and has given up all pretense otherwise. There’s none of the usual veneer of anger. There’s none of the defiance. He’s not reaching for control of the situation. He’s just gone. *You may have noted that a lot of the more craft-specific posts here have focused on portrayals of Cyclops. There are a couple reasons for that. Cyclops is one of my favorite X-Men characters, but he’s also one it’s really easy to handle poorly, and how well he’s done is–at least for me–a pretty good bar for the general quality of any given series in which he’s part of the main cast. And when Cyclops is done right, he tends to become a locus of interesting visual storytelling, because you’re taking a character who’s by definition not visually demonstrative and dropping them into a static visual medium that’s generally all about exaggerated expression. ANYWAY, last night, a conversation on Twitter–specifically pursuant to James F. Wright and Josh Eckert’s pretty damn brilliant Children of the Engine concept–reminded me of the fact that it contains what I keep thinking should be pieces of an awesome Speed Racer / X-Men conspiracy theory. Consider: Comics Cyclops is basically cosplaying Racer X at this point. 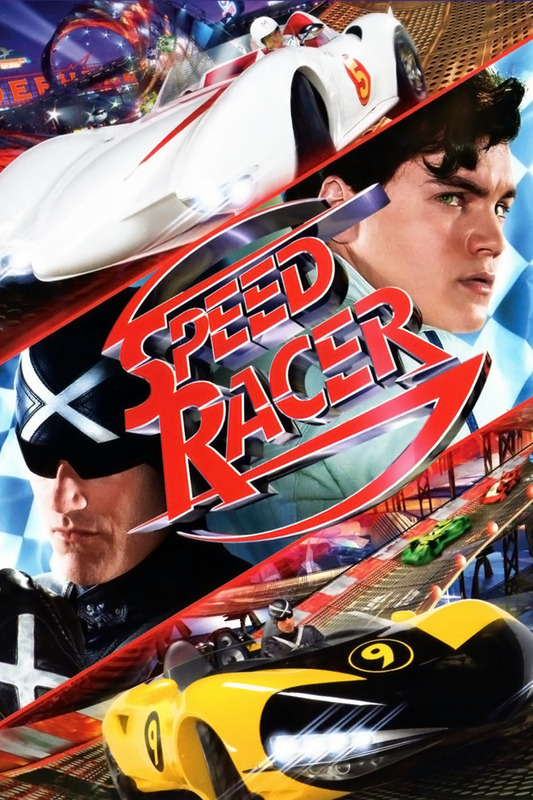 Scott Porter, who played pre-Racer X Rex Racer in the 2008 film, voiced Cyclops in both the X-Men anime and the Marvel Heroes MMO; and Racer X’s movie costume is pretty much exactly Cyclops’s old X-Factor uniform, down to the color scheme. I realize that that these things totally fail to resolve into anything resembling a respectable conspiracy theory. But I still feel vaguely that there should be something there, if only because finding a way to neatly streamline my pop-culture obsessions would probably save a lot of time and action-figure shelf space.